We seek to advance state-of-the-art artificial intelligence (AI) technology to develop next generation solutions in numerous high-impact areas. As individuals, companies, and governments produce ever-more "big data" with increasing volume, variety, and velocity, data science and machine learning have both become increasingly important in harnessing this data to deliver new insights and valuable capabilities. We are pioneering new intelligent algorithms and dynamic systems, leveraging the latest pattern recognition and statistical methods to innovate, transform, and disrupt. We develop the technologies of tomorrow, while evaluating the state of the art algorithms in new domains. We regularly work with faculty and students from computer science (CS), electrical and computer engineering (ECE), linguistics, and the Texas Advanced Computing Center (TACC). We also interact with others from Mathematics, Statistics and Data Science, Geosciences, and Information, Risk and Operations Management. Our research assistants typically have strong computing and math backgrounds. We also work with and mentor students from other backgrounds who bring other diverse skills to bear on these problem areas. The primary qualities a student needs to succeed is the passion, drive, and imagination to do good work which will change the world. We are not standing by the sidelines to wait to see what tomorrow's world will look like. Instead, we are the ones leading the charge to build technology and make discoveries that will impact the world we live in today. This is what it means to be at a world-class research university and lead the charge at the forefront of science. There's no better place to be! Danna Gurari is an Assistant Professor in the School of Information at University of Texas at Austin. Her research interests span computer vision, human computation, crowdsourcing, (bio)medical image analysis, and applied machine learning. Dr. Gurari completed her postdoctoral fellowship in the University of Texas at Austin Computer Science department, her PhD in Computer Science at Boston University in 2015, MS in Computer Science at Washington University in St. Louis in 2005, and BS in Biomedical Engineering at Washington University in St. Louis in 2005. She worked in industry for five years, from 2005-2010, at Boulder Imaging and Raytheon. Dr. Gurari received the Researcher Excellence Award from the Boston University computer science department in 2015. She and her collaborators were recognized with the 2017 Honorable Mention Award at CHI, 2014 Best Paper Award for Innovative Idea at MICCAI IMIC, and 2013 Best Paper Award at WACV. Unmil Karadkar conducts research at the intersection of Human Centered Computing, Digital Collections, and Information Visualization. He develops and evaluates interfaces for collections with a goal of supporting and innovating scholarly and academic practices in various disciplines. His cross-disciplinary collaborations include those with researchers in Geosciences, Physiology, Hispanic Studies, Educational Psychology, Atmospheric Science, and Computer Science. Unmil serves as the webmaster for the ACM/IEEE JCDL website (http://www.jcdl.info/). Matthew Lease is an Associate Professor in the School of Information at the University of Texas at Austin. 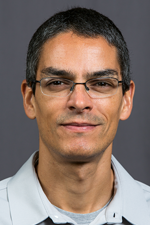 He has received early career awards from NSF and IMLS, as well as the Modeling Challenge Award at the 2012 International Conference on Social Computing, Behavioral-Cultural Modeling, & Prediction (SBP). He presented an invited keynote at the International Joint Conference on Natural Language Processing (IJCNLP) in 2011 and an invited talk at the Frontiers of Information Science and Technology meeting in 2012. He has presented crowdsourcing tutorials at ACM SIGIR (2011-2012), ACM WSDM (2011), CrowdConf (2011), and SIAM Data Mining (2013). From 2011-2013, he co-organized the Crowdsourcing Track for the National Institute of Standards and Technology (NIST) Text REtrieval Conference (TREC). Edison Thomaz is an Assistant Professor in the Electrical and Computer Engineering department of The University of Texas at Austin, with an appointment in the School of Information. He holds a Ph.D. in Human-Centered Computing from the School of Interactive Computing of the Georgia Institute of Technology, and a S.M. in Media Arts and Sciences from the MIT Media Lab. Prior to his academic appointments, Dr. Thomaz held industry positions at leading technology companies such as Microsoft and France Telecom. Edison's research is in Activiomics, a new discipline that applies computational methods towards sensing, recognizing and modeling the entire span of people's everyday life activities and context, from individual gestures to life patterns and routines. By enabling the measurement of human behaviors at a finely-grained level of detail and pairing them with bio-physiological signals obtained with environmental and wearable sensors, his work aims to provide a new technical foundation for applications and discoveries at the frontier of human health and behavior such as gene-environment interactions, predictive health from behavior markers, and personal health informatics.